Enhancing nighttime vision. Beta-carotene may lower the dark adaptation threshold as well as diminish the risk of night blindness. Combating eye complications. Studies highlight this carotenoid’s capacity to reduce the risk of age-related macular degeneration, cataracts, and even blindness. a-carotene stems from a family of vibrant red, orange, and yellow pigments known as carotenoids that permeate everyday fruits and vegetables. Since the discovery of its molecular structure in 1930, it has been routinely extracted from its natural food sources and used in medicine to improve overall health. A typical diet including fruits and vegetables generally provides an ample supply of beta-carotene. It can also be used as a synthetic supplement, although research into its benefits in this form are still under development. As a well-known antioxidant, beta-carotene is capable of boosting the immune system by countering the harmful effects of free radicals floating around the body. The protection it offers has made it a popular means of challenging heart diseases, fatigue, Alzheimer’s, psoriases and similar skin issues, and male infertility. Recent investigations have gone so far as to demonstrate its usefulness in enhancing vision. From a vision perspective, beta-carotene may be advantageous mostly for its conversion into vitamin A once in the body. When incorporated into nutrition pathways, beta-carotene is converted into retinal – which is essential for vision – and eventually into retinoic acid for cellular growth, including in the eye. Did you know? Soon after beta-carotene is consumed, it is split into not just one but two molecules of vitamin A.
f beta-carotene seem to be as a means of reducing the risk of certain eye disorders. It has specifically been proposed to delay the development of age-related macular degeneration (AMD), age-related maculopathy (ARM), cataracts4, and arguably even night blindness in pregnant women.5 Beta-carotene seems to support maintaining healthy vision and at the least helping to minimize its deterioration, especially in the elderly. Recent advancements have demonstrated the relevance of beta-carotene in vision adaptation as well. As a likely contributor to dark adaptation, beta-carotene may facilitate the performance of people who work, play, or perform in low-light or shifting-light conditions similar to the way black currant might. In addition, the carotenoid may provide a slight boost to night vision, which may just the kind of edge serious competitors are looking for. "line-height: 18.0pt;">The majority of clinical vision research centers on beta-carotene’s potential to combat certain eye problems. There’s contradictory evidence in regards to its ability to reduce the risk of age-related macular degeneration (AMD) and blindness. One area where beta-carotene seems to have a promising role is restoring and possibly even improving dark adaptation. Beta-carotene (42 mg) may not be enough to reverse night blindness during pregnancy. 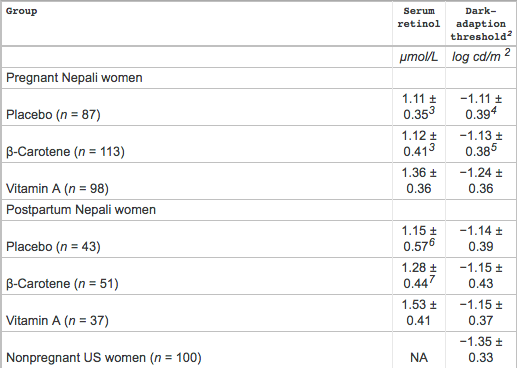 In this randomized, double-blind, placebo-controlled investigation, 202 pregnant Nepalese women who reported night blindness were given either a placebo, vitamin A at 7000 µg, beta-carotene at 42 mg, or zinc mixed in with each every day for 3 weeks. Although no significant improvements were noted in any of the groups, the vitamin A + zinc group were 4 times more likely to recuperate their night vision and also had a small improvement in pupillary threshold scores (by 0.21 log candela/m2; P = 0.09). In this randomized, double-blind, placebo-controlled investigation, approximately 202 pregnant Nepalese women who reported night blindness were given either a placebo, vitamin A, or beta-carotene throughout the course of their pregnancy. Vitamin A supplementation reduced the incidence of night blindness during pregnancy from 10.7% to 6.7%. Beta-carotene supplementation had less of an effect. Incidence (per 100 person-years) of night blindness for the first 3 months after giving birth was 8.7 for beta-carotene. In the second 3 months after giving birth, both vitamin A and beta-carotene decreased night blindness by roughly 50%. In this prospective follow-up study, 464 adults with early age-related maculopathy (ARM) and 316 adults with neovascular ARM were assessed for food, antioxidant, and carotenoid intake. An inverse association was found between carotenoid-bearing fruit intake and the risk of neovascular ARM. Adults who consumed 3 or more servings of fruit daily had a decreased relative risk of neovascular ARM at 0.64 compared with those consuming ‹1.5 servings per day but no significant effect in standard ARM. In this case-control investigation, 356 adults between 55 and 80 years of age with advanced age-related macular degeneration (AMD) were assessed for the impact that natural carotenoid intake had on their eyes. 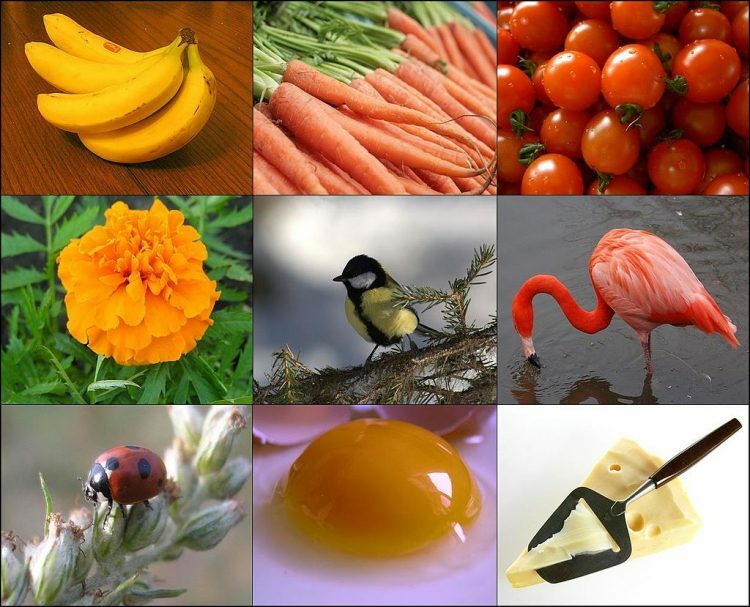 Adults in the highest quintile of carotenoid intake had a 43% lower risk for AMD. Several food items rich in carotenoids (especially lutein and zeaxanthin) were inversely associated with AMD. In this prospective-design Rotterdam study, the impact of diet and supplementation was assessed in 4170 adults over the age of 55 years over the course of about 8 years. At the end of the investigation, high dietary consumption of vitamin E and zinc was tied to a reduced risk of age-related macular degeneration (AMD), and an above-average intake of a mixture of vitamins C and E, beta-carotene, and zinc was linked to a 35% lower risk of incident AMD. In this double-masked investigation, 3640 patients between 55 to 80 years old were given a combination of vitamin C, 500 mg, vitamin E, 400 IU, and beta-carotene, 15 mg daily both with and without zinc. 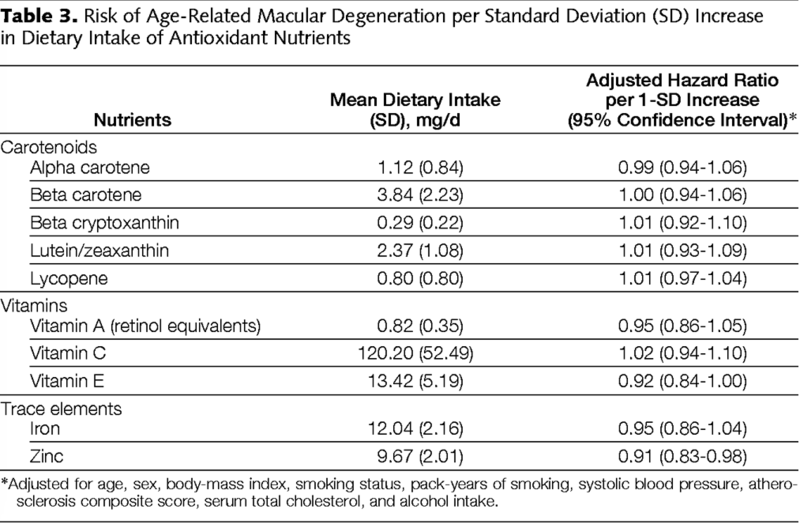 Antioxidants plus zinc significantly reduced the risk of progressing from age-related macular degeneration (AMD) to advanced AMD as well as lowered the rates of visual acuity loss (OR, 0.73; 99% CI, 0.54-0.99). In this double-blind, placebo-controlled investigation, 535 pregnant women were given either a placebo, vitamin A at 7000 µg, or beta-carotene at 7000 µg throughout their pregnancy and assessed postpartum. Women with higher serum retinol concentrations had lower (better) dark-adaptation thresholds, which turned out to be better in vitamin A than beta-carotene groups. Although beta-carotene generally has few side effects, it has even less risk when consumed via natural food products, which contain a mixture of all-trans beta-carotene and 9-cis beta-carotene, whereas synthetic beta-carotene only comes in the form of all-trans beta-carotene. Beta-carotene has potential vision benefits. We recommend trying beta-carotene in combination with other nutrients for maximum impact. While beta-carotene alone may moderately improve dark adaptation and reduce the risk of eye conditions, such as age-related macular degeneration, it seems to have more potency when mixed with zinc and other antioxidants. What’s more, it seems to be less effective than its other form, vitamin A. Try combining beta-carotene with zinc, vitamin C, and vitamin E. The body converts beta-carotene into vitamin A and we suggest using the latter. For those who are set on taking beta-carotene, it seems to be most efficient when mixed as 15 mg beta-carotene, 500 mg vitamin C, 400 IU vitamin E, and 80 mg zinc.